Do not send new messages, take new pictures, or open your apps. Better yet, stop using your phone. Do not attempt to restart your phone for multiple times. Check if you have recently synced your iPhone with iCloud or iTunes. You might wonder about item number 1. That is just a measure to keep your iPhone from creating new files. In reality, even though you can’t see your messages, they are just stored in your phone’s memory. They stay there until they are eventually overwritten by new data. If your erased SMS got overwritten, then the chance of recovery is near to zero. Restarting your phone is inadvisable as it may lead to unwanted outcomes. Although it may be harmless, it’s better to be on the safe side. It’s good, too, if you were able to keep backups of your iPhone’s files. That way, you can easily access them when you need them. However, verify the last backup date first. Text messages are more difficult to backup just because you can send and receive new ones at any moment. For example, you synced your iPhone with iTunes yesterday. That would mean that the new messages today were not included in the backup. If you also need your most recent messages, then that would prove to be a big problem. Good thing, we have a proposal for you. You’ll learn all about it in part 3 of this post. But if you’re confident with your backup, then you can try to recover your deleted text messages with it. The next section of this article will guide you through it. Connect your iPhone to a stable internet connection. Head to Settings and tap General. Select Reset and tap Erase All Content and Settings. You will be prompted to enter your passcode. Select Erase iPhone. Remember, clicking this will reset your iPhone. That means deleting all data and settings. As your iPhone is being formatted, it will restart. Once it is on again, tap Restore from iCloud Backup from the choices. Select the backup file you think has your messages. Launch iTunes on your computer and turn off automatic syncing. Connect your iPhone to the computer. Once iTunes detects your phone, your device’s name will appear on the top right corner of the window. Click on it. iCloud and iTunes backups are convenient to have. However, is it easy and safe to restore them? Not really. First, you need to reset your phone and delete all existing data. That puts your data at risk. Second, it takes too much time to delete everything then restore everything. If you just lost your text messages, why go the trouble to recover your other files too? 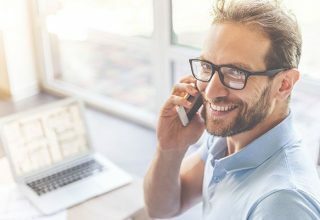 If you think it’s not worth the risk, then you can try out one of the 3 deleted text messages recovery solutions we’ve prepared for you. We guarantee you, they work! FoneDog iOS Data Recovery is the answer to your problem. It is a data recovery software that can restore lost data due to accidental deletion, phone damage, malware attack, and even a failed iOS update. It’s no magic. It’s about taking advantage of your iPhone’s memory or your iCloud or iTunes backup. It does so safely and efficiently. 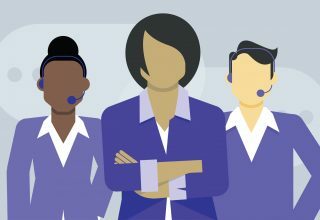 As you explore these 3 solutions, you’ll learn how they work to recover your messages. That way, you’ll feel assured that your existing data stays safe no matter what. When your iPhone is connected to your computer, the software can scan its memory and detect all files. Those include existing, deleted and lost files. 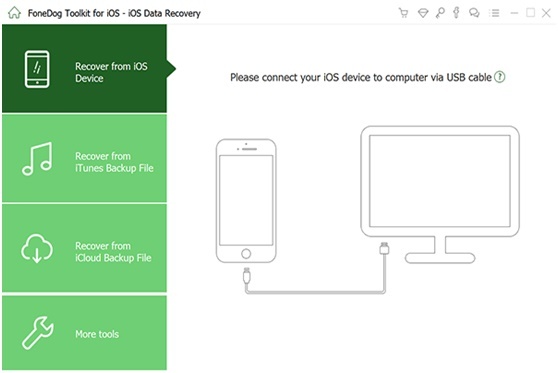 Run FoneDog iOS Data Recovery. Connect your iPhone to the computer using a USB cable. 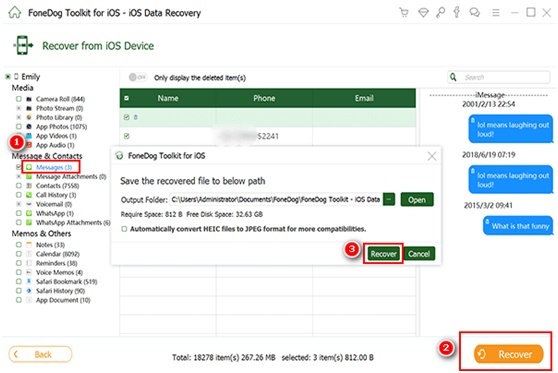 Select Recover from iOS Device from the available recovery options. Click Start Scan to proceed. A list of file types will be shown on the left side of the interface. Select Messages. On the other side of the window, you will see a preview of the list of found messages. Go over the messages and tick the boxes of the items that you need to recover. Click Recover to start the download. 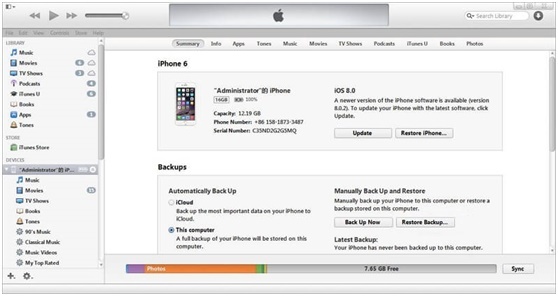 Once you are logged in to your iCloud account via the software, it gains access to your chosen backup file. You can choose specific file types you want to be restored so FoneDog can extract files faster. When it is done, you can preview and choose your desired files, and the software recovers them for you in a click. 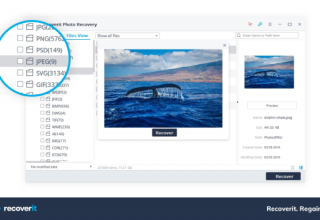 It restores files without the need to reset your phone and retrieve all data from your backup. Launch the software and connect your phone to the computer. 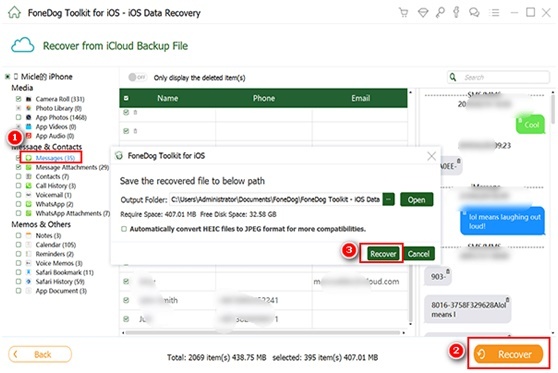 Click Recover from iCloud Backup File from the left tab of the interface. Log in to your iCloud account by entering your Apple ID and password. A list of your iCloud backup files will appear. 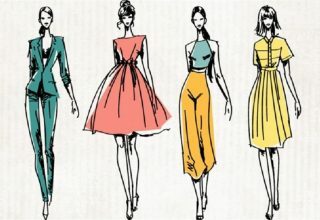 Select one and hit Download. You will be prompted to select the file types that you need. Since your goal is to recover deleted text messages, mark on Messages. Click Next. You will see the available messages on your iCloud backup. Select on those you want to restore and click Recover. The software scans your selected iTunes backup file and provides you with a preview of all saved files. You can selectively restore files and instantly download them to your computer. Open the software and connect your iPhone to the computer. 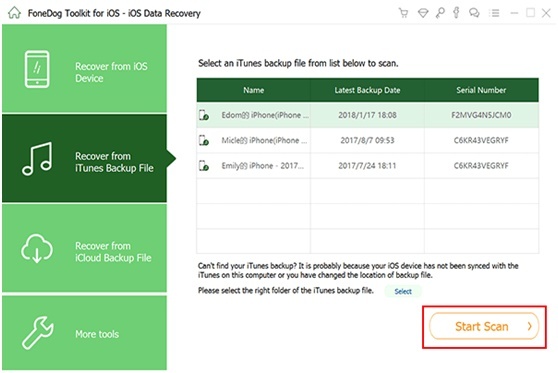 Choose Recover from iTunes Backup File as the recovery method. Select one from the available iTunes backup files and hit Start Scan. 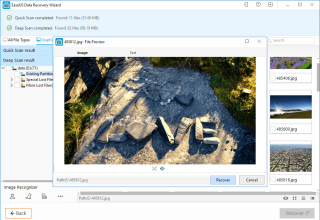 From the recoverable file types, select Messages. On the preview section of the window, scroll through your SMS and tick the boxes of those you want to restore. On the bottom right corner of the interface, click Recover.